Japanese kuro gyaru with silver hair wearing a top, shorts, and belt from D.I.A. along with Flag-J platform heels. Three Harajuku shironuri wearing handmade and vintage fashion along with items from Takuya Angel, Emily Temple, and Parabolica-Bis. Harajuku guy in button down, shorts and sneakers with girl in gyaru sweater dress, wide belt, bow headband and over the knee boots. Over 100 pictures of lucky bag shopping overload at Shibuya 109 and around the streets of Shibuya during the first day of New Year sales 2012. An interview with Japan’s hottest kuro gyaru (dark skin gals) unit Black Diamond. 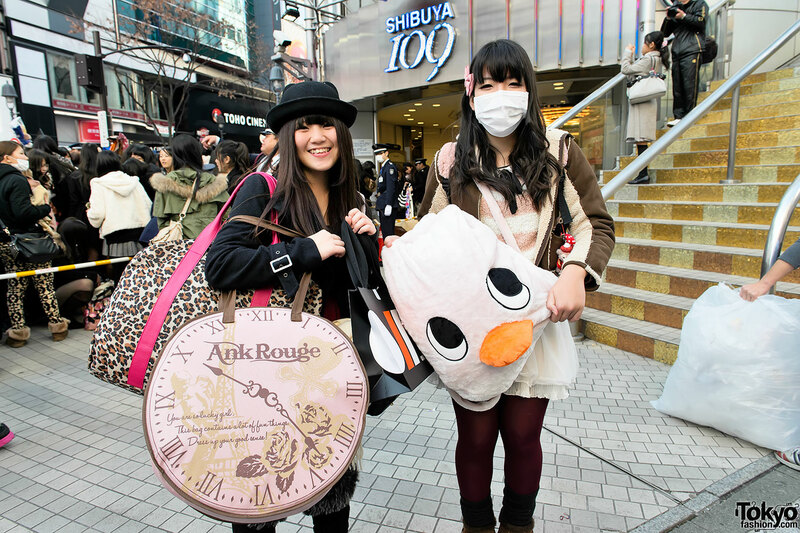 Featuring pictures and video of 20+ tan Japanese gals – with amazing fashion, hair, nails and makeup – around Shibuya.